Infection is the most common cause of hospitalization and the second most common cause of mortality among hemodialysis (HD) patients, after cardiovascular disease. HD patients are exposed to different types of infection, which include bloodstream infections and localized infections of the vascular access, blood-borne infections with hepatitis B virus (HBV), hepatitis C virus (HCV) and/or human immunodeficiency virus (HIV) and airborne infections like tuberculosis. Sources of infections could be contaminated water, equipment and environmental surfaces in the treatment area and patients with infections who pose a risk to other nearby patients being treated in the dialysis unit. The increased risk for contracting health-care-associated infections (HAIs) among HD patients are mainly due to (a) immune compromised status, (b) frequent and prolonged blood exposure during HD treatments through the vascular access and extra-corporeal circuit (with many ports and connections), (c) close proximity to other patients during treatment in the HD facility, (d) frequent contact with health-care workers, who frequently move between patients and between machines, (e) frequent hospitalization and surgery, and most importantly, (f) non-adherence or a break in implementation of recommended practices. In addition to standard precautions, the international guideline-generating bodies recommended several specific infection prophylactic strategies for implementation in the HD settings. However, these published guidelines are usually extensive and sometimes variable. To facilitate access to concise information, increase the awareness and encourage implementation of recommended practices in HD units, we reviewed, extracted and compared the essential elements of infection prevention and control in HD units as recommended by the Centers for Disease Control and Prevention (CDC), the Association of Professionals in Infection Control (APIC), the Kidney Disease Outcomes Quality Initiative (K/DOQI), the European Best Practice Guidelines/Renal Best Practice (EBPG/ERBP) and the Kidney Disease: Improving Global Outcomes (KDIGO). 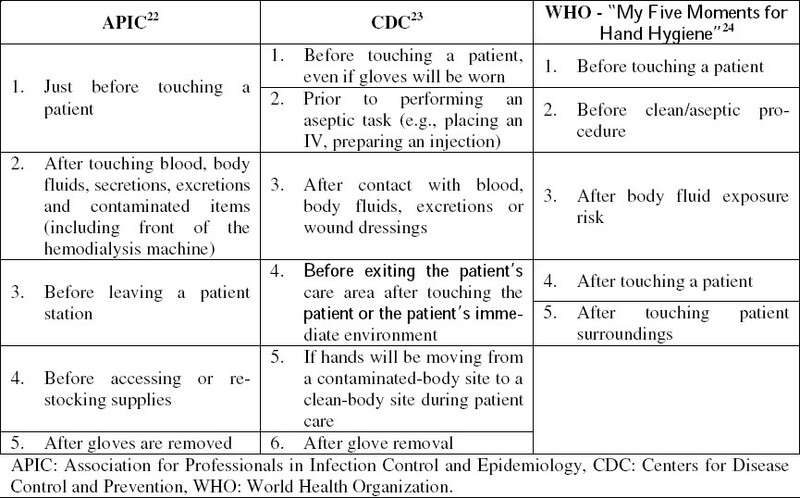 Table 1: Hand hygiene indications as recommended by the APIC, CDC and WHO. Table 2: Estimated minimum number of times where hand hygiene is required per dialysis session per patient (regardless of use of gloves). Personal protective equipment (PPE) refers to a variety of barriers and respirators used alone or in combination to protect mucous membranes, airways, skin and clothing from contact with infectious agents. They include gloves, gowns, masks, eye goggles, face shields and respirators. In the HD setting, gloves are recommended to be worn whenever caring for a dialysis patient, whether touching patient's intact skin (e.g., taking blood pressure) or patient's equipment at the dialysis station. Gloves should be removed and followed by hand hygiene between patients or stations. , The recommended practice of glove use for every contact with the patient(s) and equipment(s) at the dialysis station requires an enormous amount of glove supply, which is not always realistic in many HD units. However, when visible soiling is present and/or contact precautions are indicated, wearing gloves is a must. Sterile gloves must be used during procedures requiring a sterile aseptic technique, such as during catheter insertion or at any time a dialysis catheter is handled/manipulated. ,, Wearing gowns (fluid-resistant with full coverage of the arms and body front and preferably disposable ones) over the uniform and use of a face mask and eye goggles or face shield is recommended when performing procedures wherein splashes of blood can be anticipated, especially during initiation and discontinuation of dialysis. ,, If a face shield is used during catheter handling, a surgical mask should be worn underneath to protect the patient from the HCW's respiratory droplets. Equally important is the fact that the patient should also wear a mask and be asked to turn his/her face away from the catheter site to reduce contamination from infectious droplets. ,,, Furthermore, wearing a mask is important when a staff member, a patient or a visitor is experiencing cold or cough. , A respirator should be used by HCWs only when taking care of a patient with an airborne infection. HCWs uniforms can be colonized with potentially pathogenic bacteria in up to 60% of the situations, ,,,,, and, therefore, should be washed and changed daily in order to decrease the bacterial load. It is recommended to clean and disinfect the external surfaces of the HD machine after each dialysis session. ,, A low-level disinfectant or any EPA-registered disinfectant solution labeled for use in a health-care setting is recommended to be used on non-critical items (including HD machines), and should also be in accordance with the machine manufacturer's recommendations. The presence of bio-burden will reduce the killing/inactivating effect of disinfectants. Therefore, if visible blood spills or other infectious material is present on the external surface of an HD machine, it should be cleaned separately (not to spread) before applying the disinfectant solution. In such cases, it is recommended to use an intermediate-level disinfectant or tuberculocidal agent (with specific label claims for HBV and HIV) or a 1:100 dilution of a hypochlorite solution (500-600 ppm free chlorine). If using disinfectant wipes, one wipe should be used to exclusively clean the blood stain followed by another wipe(s) for disinfection. All external surfaces of the machine, especially the frequently touched front panel, including the intravenous pole, the side, back and base, should be thoroughly cleaned and disinfected using friction and be allowed to air dry. All used towels or wipes and gloves that are contaminated with blood should be discarded in a biohazard waste container, and hand hygiene performed after glove removal. Auxiliary equipment used in HD may include reusable jugs for mixing bicarbonate solution, reusable priming buckets and external pressure transducers. As per recommendation, any re-usable item should be cleaned and disinfected prior to being used on another patient, and external pressure transducers should be changed between patients' uses. Nowadays, many units have shifted to using the more hygienic automated process of mixing bicarbonate powder in cartridge on the individual machines, eliminating the use of reusable bicarbonate jugs. If bicarbonate solution in a jug is used, any "leftover" solution must be discarded and opened jugs should not be used after 24 h because sodium bicarbonate solution constitutes a good media for bacterial growth. Reusable priming buckets are now seldom used as most dialysis companies include a disposable prime collection bag in each pack of sterile bloodline set and also with pre-attached external pressure transducers. With improved and better technology in some of the newer models of HD machines, prime collection bags or transducer protectors are not even required, because drainage of priming solutions can be done by connecting the bloodline to a drainage port in the machine and blood pressure sensors are completely non-invasive without using transducer connections and protectors. Both CDC and APIC have recommended specific measures that include the following: (a) items taken into an individual patient's HD station should be used only for that patient and be disposed off after use, (b) unused item(s) should be cleaned and disinfected before returning to a common clean area or used on another patient, or be disposed off if it cannot be disinfected and (c) non-disposable items that cannot be comprehensively cleaned and disinfected (e.g., adhesive tape, cloth-covered blood pressure cuffs) should be dedicated for use on a single patient. , In reality, allocating a blood pressure cuff for each patient may not be practical as too frequent detachment and re-attachment of the cuff can cause imminent damage to the line connections. Reusable blood pressure cuffs that are covered with waterproof material with a smooth surface (instead of cloth-covered cuffs) can be an attractive alternative as they can be comprehensively cleaned and disinfected between patient uses. There should also be a clear separation for storage and handling of clean supplies and medications from contaminated items (i.e., used supplies/equipment, blood samples, biohazard containers). Water quality is an essential component in the provision of good HD and in ensuring patient safety. This is especially the case in the settings of high-flux HD, hemofiltration and/or hemodiafiltration due to possible entrance of contaminants from the dialysis fluid into the blood by either convective transfer (back-filtration) or movements down the concentration gradient (back-diffusion) or the direct infusion of substitution fluid into the circulation. Failure to meet water quality standards has major consequences and may lead to increased patient morbidity and mortality. Studies have demonstrated that ultrapure dialysis fluid is associated with a reduction in inflammatory markers, reduced chronic inflammation, decreased erythropoietin resistance, preservation of residual renal function, a reduction in cardiovascular morbidity, a reduction in β2-microglobulin amyloidosis and decreased levels of advanced glycation end-products. , Both CDC and APIC recommend adherence to the standards set by the Association for the Advancement of Medical Instrumentation (AAMI) for the quality of water used in dialysis. Fluids used for dialysis can be divided into three levels according to microbiological quality: Standard, ultrapure and sterile. The maximum allowable levels of microbiological contaminants and endotoxin in each level are summarized in [Table 3]. "Online" prepared solutions that are used as substitution fluids and priming solutions (intravenous infusion) during hemofiltration and hemodiafiltration are considered as drugs and, therefore, should be sterile and non-pyrogenic. ,,, The quality of the fluid before the final filter (from the first bacteria- and endotoxin-retentive filter) and the functioning of this filter both determine whether the final fluid can be referred to as sterile and non-pyrogenic. In this case, the fluid sample for micro-biologic testing should be taken from the dialysate sampling port (fluid that has passed only from the first filter). If the dialysate sample meets the standard for ultrapure water, then the substitution fluid (fluid that passed the second filter) can be assumed as sterile. Others insist that one other condition must be fulfilled in order to achieve a sterile fluid: A sterile, single-use filter must be used for the final filtration step, which is according to the definition in pharmacopoeias. Frequent heat disinfection of the distribution loop is the preferable method to prevent formation of bio-film. Testing of product water of in-center reverse osmosis (RO) for bacteria and endotoxin assay are required at least monthly, , and on a quarterly basis for portable RO or in a home setting. To avoid false-negative results, fluid sampling for microbiological testing should be performed no sooner than 24 h after disinfection and, when disinfection is performed on consecutive days (or more frequently), samples should be taken before and as close as practicable to a disinfection procedure. Analysis results from poor cultivation technique used by the laboratory can be misleading and may expose patients to high risks of adverse reactions. Suitable cultivation techniques are shown in [Table 4]. Table 3: Maximum allowable levels for total viable microbial count (TVC) and endotoxins in dialysis water, in standard and ultrapure dialysis fluid (dialysate) and online-prepared substitution fluid. Table 4: Cultivation techniques for dialysis water and dialysis fluids. Aside from the basic principles of aseptic technique, there are specific complementary recommendations for HD published by the CDC and APIC, which include the following: (a) all single-use injectable medications and solutions should be dedicated for use on a single patient and be used one time only, (b) medications packaged as multi-dose should be assigned to a single patient whenever possible, (c) medication preparation should occur in a clean area away from the patient treatment area, and be delivered separately for each patient, (d) to not carry multi-dose vials from station to station or carry medication vials, syringes, alcohol swabs or supplies in pockets, (e) unused medications or supplies taken to the patient's station should be used only for that patient and should not be returned to a common clean area or used on other patients, (f) to not use common medication carts to deliver medications to patients and, if trays are used to deliver medications to individual patients, they must be cleaned between patients. ,, The CDC's full recommendations on safe injection practices are shown in [Table 5]. 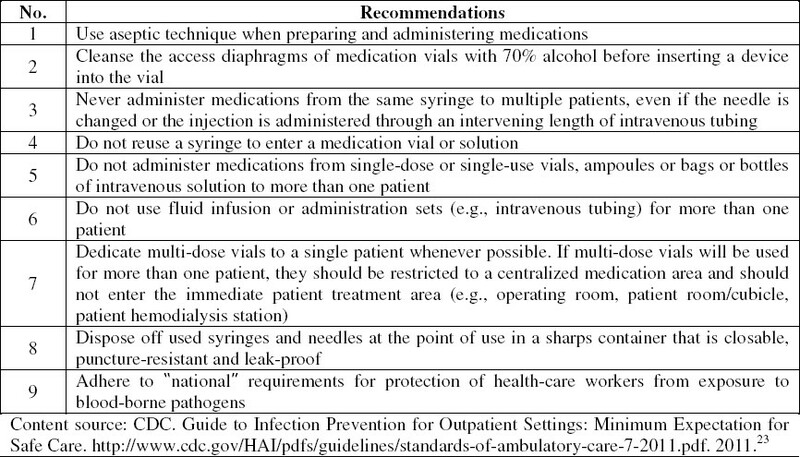 Table 5: Key recommendations on safe injection practices in ambulatory care settings. Infection rates with tunneled dialysis catheters has been estimated to be 10-times higher than that of arteriovenous fistula (AVF) or AV graft,  and is found to be the leading risk factor of bacteremia in chronic HD patients. The international bodies are in concert with the guidelines that vascular access should be a native AV fistula whenever possible, AV graft as the next preferred option and the use of catheters to be avoided as much as possible. 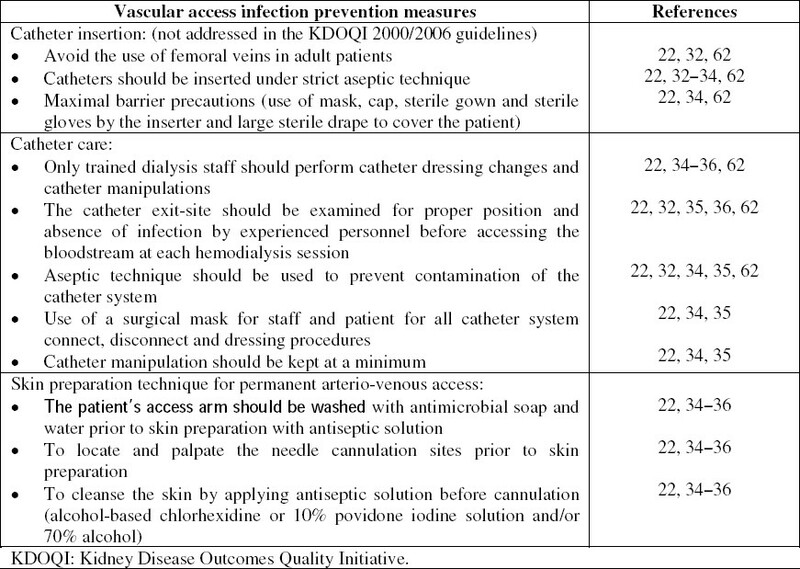 ,,,,, Vascular access infection prevention measures unanimously recommended by the international bodies are outlined in [Table 6], and varying messages on dialysis catheter recommendations are outlined in [Table 7]. The relevance of "rubbing and soaking the catheter hub with the cap on with a povidone iodine swab for 3-5 minutes before the cap is removed" (as recommended by KDOQI) is understandably to disinfect the outside surface, thereby preventing inadvertent contamination of the inner hub and the resultant bloodstream contamination. In the 2011 update of the CDC Guidelines for the Prevention of Catheter-Related Infections, scrubbing of the access port with an appropriate antiseptic (chlorhexidine, povidone iodine, an iodophor or 70% alcohol) was recommended for needleless intravascular catheter systems. The routine scrubbing of dialysis catheter hubs (after cap removal before accessing and before replacing a new cap) with an appropriate antiseptic was included as part of a recent CDC's core interventions for dialysis bloodstream infection (BSI) prevention [Table 8]. Dialysis providers are cautioned to avoid inadvertent introduction of the used antiseptic solution into the bloodstream. In an in vitro study by Salzman et al, the potential for the antiseptic used in cleaning the open catheter hub as well as few strands of cotton fibers to enter the blood-stream (simulated) and the effectiveness of normal saline solution (used as control) to reduce the microbial load at a level greater than 99% of the total number of microorganisms (suggesting mechanical removal) was demonstrated. The cumulative effect of minute residues of toxic antiseptics and foreign substance that may get into the patient's bloodstream when applied repeatedly on open catheter hubs among chronic HD patients have not, and may not, be studied. Therefore, it is prudent to choose a safe and non-toxic solution for cleaning open catheter hubs and to emphasize the application of friction while cleaning (scrubbing not just wiping). Table 6: Common recommendations on vascular access infection prevention. Table 7: Varying insructions on catheter-related infection prevention strategies. Table 8: The Center for Diseases Control core interventions for dialysis bloodstream infection (BSI) prevention. Because HD patients are more immune compromised than other surgical patients, pre-surgical infection prevention measures are recommended, which include: (a) pre-surgical shower/bath with an antiseptic agent such as chlorhexidine, the night before and morning of surgery, (b) if hair removal is necessary, to use clippers instead of razors to prevent infection associated with micro-abrasions resulting from razor use and (c) avoiding intravenous placements and phlebotomy in the arm where access is to be placed (helps prevent infection and maintains vasculature integrity). Screening and decolonization for MRSA before an elective surgery may be used as an additional measure. Table 9: Recommendations on hepatitis B virus, hepatitis C virus and human immunodeficiency virus screening/testing and patient placement. These viral diseases, however, remain a potential risk to both HD patients and staff for the following reasons: (a) there is no vaccine as yet to confer immunity for HCV and HIV, (b) the incidence of chronic persistent infection after an acute episode is high in both HCV (80-90%) and HIV (100%), (c) the prevalence of patients with chronic HCV is currently higher than that of HBV, and is much higher among the HD population, (d) the consequence of having a chronic infection with either HCV or HIV can be severe and/or fatal and (e) of utmost significance is the fact that implementation of standard precautions and stricter measures of infection control recommended for HD units cannot always be guaranteed to be consistently and reliably adhered to. Even in HD units with an "ideal set-up," unintentional breach of recommended infection control practices (i.e., as hand hygiene) do occur, especially at times when urgent interventions are required. Many studies have proven that segregating HD patients according to their virology status have resulted in a decrease in the incidence and prevalence of infections. ,,,,,,,, By simple logic, this can be attributed to the physical barrier that prevents exposure of susceptible patients to patients who have identified infection/colonization with pathogenic microorganisms. The staff movements between susceptible and infected patients will definitely be prevented, as well as the sharing of possibly contaminated equipment and other items. Another strategy that can be used is the "temporal segregation," wherein patients who are suspected of being infectious are dialyzed in the last shift. This simple and low-cost strategy is effective in preventing the immediate exposure of other susceptible patient(s) to possibly contaminated environmental surfaces and equipment used by a source patient. Also, the time factor (allowing more time before reusing the equipment and treatment area for another susceptible patient) may add to the effect of disinfection in attenuating the level of contamination. Table 10: Doses and schedules of licensed hepatitis B vaccines for hemodialysis patients. 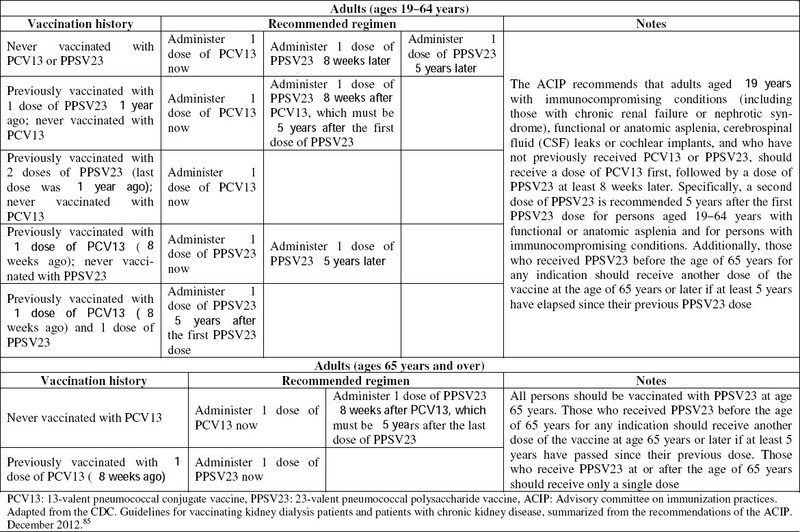 Table 11: Guidelines for administering pneumococcal vaccines (PCV13 and PPSV23) for adults with chronic kidney disease. 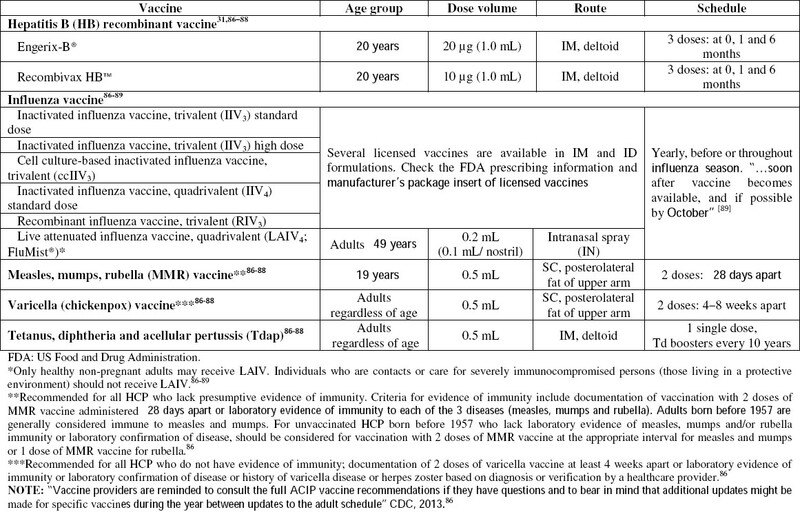 Table 12: Immunization of health-care personnel (based on the CDC/ACIP recommendations). Table 13: Additional testing to be performed in case of positive seroconversions. Education and training in infection prevention and control should be provided to all health-care workers upon hire, and should be repeated regularly (at least on a yearly basis). Basic principles and practices for preventing the spread of infections should be covered and staff competencies should be assessed and documented upon orientation to the facility, and this should be repeated as appropriate for the specific staff and position. The patient(s) and/or caregiver(s) should also be educated on the care of new access and whenever there is a change in access type, and this should be repeated at least every year. Key areas for patient education as outlined by the CDC are shown in [Table 14]. Table 14: Key areas for patient education. Evidence-based international guidelines are of great value and are instrumental in helping reduce health-care-associated infections. The cornerstone toward risk reduction is to be aware and abreast with the latest guidelines and be keen in implementing them reliably and consistently, as well as being conscientious and alert/active in engaging in quality improvement projects. The decision to follow any guideline statement must be made individually, by each HD unit at different locations with varying conditions, according to the incidence and prevalence of any type of infection. However, patient's safety and well-being deserves top priority in whatever decision is to be made. 1. Fridkin SK, Pear SM, Williamson TH, Galgiani JN, Jarvis WR. The role of understaffing in central venous catheter-associated bloodstream infections. Infect Control Hosp Epidemiol 1996;17:150-8. 2. Vicca AF. Nursing staff workload as a determinant of methicillin-resistant Staphylococcus Aureus spread in an adult intensive therapy unit. J Hosp Infect 1999;43:109-13. 3. Harbarth S, Sudre P, Dharan S, Cadenas M, Pittet D. Outbreak of Enterobacter cloacae related to understaffing, overcrowding, and poor hygiene practices. Infect Control Hosp Epidemiol 1999;20:598-603. 4. Arenas MD, Sanchez-Paya J, Barril G, et al. A multicentric survey of the practice of hand hygiene in haemodialysis units: Factors affecting compliance. Nephrol Dial Transplant 2005;20:1164-71. 5. Cimiotti JP, Aiken LH, Sloane DM, Wu ES. Nurse staffing, burnout, and healthcare-associated infection. Am J Infect Control 2012; 40:486-90. 6. Efstathiou G, Papastavrou E, Raftopoulos V, Merkouris A. Factors influencing nurses′ compliance with Standard Precautions in order to avoid occupational exposure to microorganisms: A focus group study. BMC Nurs 2011;10:1. 7. Sax H, PernegerT, Hugonnet S, Herrault P, Chraiti MN, Pittet D. Knowledge of standard and isolation precautions in a large teaching hospital. Infect Control Hosp Epidemiol 2005; 26:298-304. 8. Oliveira AC, Cardoso CS, Mascarenhas D. Contact precautions in intensive care units: Facilitating and inhibiting factors for professionals′ adherence. Rev Esc Enferm USP 2010;44:161-5. 9. Madan AK, Raafat A, Hunt JP, Rentz D, Wahle MJ, Flint LM. Barrier precautions in trauma: Is knowledge enough? J Trauma 2002; 52:540-3. 10. Kelen GD, DiGiovanna TA, Celentano DD, et al. Adherence to Universal (Barrier) Precautions during interventions on critically ill and injured emergency department patients. J Acquir Immune Defic Syndr 1990;3:987-94. 11. Pittet D, Dharan S, Touveneau S, Sauvan V, Perneger TV. Bacterial contamination of the hands of hospital staff during routine patient care. Arch Intern Med 1999;159:821-6. 12. Bauer TM, Ofner E, Just HM, Just H, Daschner FD. An epidemiological study assessing the relative importance of airborne and direct contact transmission of microorganisms in a medical intensive care unit. J Hosp Infect 1990;15:301-9. 13. Pittet D. Improving adherence to hand hygiene practice: A multidisciplinary approach. Emerg Infect Dis 2001;7:234-40. 14. Bhalla A, Pultz NJ, Gries DM, et al. Acquisition of nosocomial pathogens on hands after contact with environmental surfaces near hospitalized patients. Infect Control Hosp Epidemiol 2004;25:164-7. 15. Larson E. A causal link between hand washing and risk of infection? Examination of the evidence. Infect Control Hosp Epidemiol 1988;9:28-9. 16. Farrington M, Ling J, Ling T, French GL. Outbreaks of Infection with methicillin-resistant Staphylococcus aureus on neonatal and burn units of a new hospital. Epidemiol Infect 1990;105:215-28. 17. Gould D. Nurses′ hands as vectors of hospital-acquired infection: A review. J Adv Nurs 1991;16:1216-25. 18. Duckro AN, Blom DW, Lyle EA, Weinstein RA, Hayden MK. Transfer of vancomycin-resistant enterococci via healthcare worker hands. Arch Intern Med 2005;165:302-7. 19. Shimokura G, Weber DJ, Miller WC, Wurtzel H, Alter MJ. Factors associated with personal protection equipment use and hand hygiene among hemodialysis staff. Am J Infect Control 2006;34:100-7. 20. Kampf G, Kramer A. Epidemiologic background of hand hygiene and evaluation of the most important agents for scrubs and rubs. Clin Microbiol Rev 2004;17:863-93. 21. Boyce JM, Pittet D; Healthcare Infection Control Practices Advisory Committee; HICPAC/SHEA/APIC/IDSA Hand Hygiene Task Force. Guideline for Hand Hygiene in Health-Care Settings: Recommendations of the Healthcare Infection Control Practices Advisory Committee and the HICPAC/SHEA/ APIC/IDSA Hand Hygiene Task Force. Society for Healthcare Epidemiology of America/Association for Professionals in Infection Control/Infectious Diseases Society of America. MMWR Recomm Rep 2002; 51:1-45. 26. Infection Control Today (ICT). Challenges and Solutions for Measuring Hand Hygiene Compliance. On-Demand Webinar, October 18, 2013. 27. Lin CM, Wu FM, Kim HK, Doyle MP, Michael BS, Williams LK. A comparison of hand washing techniques to remove Escherichia coli and caliciviruses under natural or artificial fingernails. J Food Prot 2003;66:2296-301. 28. Edel E, Houston S, Kennedy V, LaRocco M. Impact of a 5-minute scrub on the microbial flora found on artificial, polished, or natural fingernails of operating room personnel. Nurs Res 1998;47:54-9. 29. Pottinger J, Burns S, Manske C. Bacterial carriage by artificial versus natural nails. Am J Infect Control 1989;17:340-4. 30. Hedderwick SA, McNeil SA, Lyons MJ, Kauffman CA. Pathogenic organisms associated with artificial fingernails worn by healthcare workers. Infect Control Hosp Epidemiol 2000;21:505-9. 31. Centers for Disease Control and Prevention. Recommendations for preventing transmission of infections among chronic hemodialysis patients. MMWR Recomm Rep 2001;50:1-43. 32. Vanholder R, Canaud B, Fluck R, et al. Diagnosis, prevention and treatment of haemodialysis catheter-related bloodstream infections (CRBSI): A position statement of European Renal Best Practice (ERBP). NDT Plus 2010; 3:234-46. Available from: http://www.european-renal-best-practice.org/content/guidelines-topic-dialysis-hd. 33. Tordoir J, Canaud B, Haage P, et al. EBPG on Vascular Access. Nephrol Dial Transplant 2007;22:ii88-117. 34. ERA/EDTA Guidelines. European Best Practice Guidelines for Haemodialysis (Part 1), Section VI - Haemodialysis-associated infection. Nephrol Dial Transplant 2002;17:76. 35. National Kidney Foundation KDOQI Clinical Practice Guidelines and Clinical Practice Recommendations 2006 Updates: Hemodialysis Adequacy, Peritoneal Dialysis Adequacy and Vascular Access. Am J Kidney Dis 2006; 48 Suppl 1:S1-322. 36. National Kidney Foundation KDOQI Clinical Practice Guidelines for Vascular Access, 2000. Am J Kidney Dis 2001;37 Suppl 1: S137-81. 37. Wiener-Well Y, Galuty M, Rudensky B, Schlesinger Y, Attias D, Yinnon AM. Nursing and physician attire as possible source of nosocomial infections. Am J Infect Control 2011;39:555-9. 38. Perry C, Marshall R, Jones E. Bacterial contamination of uniforms. J Hosp Infect 2001;48: 238-41. 39. Babb JR, Davies JG, Ayliffe GA. Contamination of protective clothing and nurses′ uniforms in an isolation ward. J Hosp Infect 1983;4:149-57. 40. Fijan S, Turk SŠ. Hospital textiles, are they a possible vehicle for hospital-associated infection? Int J Environ Res Public Health 2012; 9:3330-43. 41. Wilson JA, Loveday HP, Hoffman PN, Pratt RJ. Uniform: An evidence review of the microbiological significance of uniforms and uniform policy in the prevention and control of healthcare-associated infections. Report to the Department of Health (England). J Hosp Infect 2007;66:301-7. 42. Jackson R, Cole M. Healthcare workers′ uniforms: Roles, types and determining policy. Br J Nurs 2010;19:438-41. 43. Kramer A, Schwebke I, Kampf G. How long do nosocomial pathogens persist on inanimate surfaces? A systematic review. BMC Infect Dis 2006;6:130. 44. Dietze B, Rath A, Wendt C, Martiny H. Survival of MRSA on sterile goods packaging. J Hosp Infect 2001;49:255-61. 45. Bond WW, Favero MS, Peterson NJ, Gravell CR, Ebert JW, Maynhard JE. Survival of hepatitis B virus after drying and storage for one week. The Lancet 1981;1:550-1. 47. Ciesek S, Friesland M, Steinmann J, et al. How stable is the hepatitis C virus (HCV)? Environmental stability of HCV and its susceptibility to chemical biocides. J Infect Dis 2010;201:1859-66. 48. Barré-Sinoussi F, Nugeyre MT, Chermann JC. Resistance of AIDS virus at room temperature. Lancet 1985;11:721-2. 49. Tjotta E, Hungnes O, Grinde B. Survival of HIV-I: Activity after disinfection, temperature and pH changes, or drying. J Med Virol 1991; 35:223-7. 50. Cataòo JC, Echeverri LM, Szela C. Bacterial Contamination of Clothes and Environmental Items in a Third-Level Hospital in Colombia. Interdiscip Perspect Infect Dis 2012;2012: 507-640. 51. Dancer SJ. The role of environmental cleaning in the control of hospital-acquired infection. J Hosp Infect 2009;73:378-85. 52. Rutala WA, Weber DJ, and the Healthcare Infection Control Practices Advisory Committee (HICPAC). Centers for Disease Control and Prevention. Guideline for the Disinfection and Sterilization in Healthcare Facilities, 2008. 53. ERA/EDTA Guidelines. European Best Practice Guidelines for Haemodialysis (Part 1), Section IV - Dialysis fluid purity. Nephrol Dial Transplant 2002;17 Suppl 7:45-62. 54. Damasiewicz MJ, Polkinghorne KR, Kerr PG. Water quality in conventional and home haemodialysis. Nat Rev Nephrol 2012;8:725-34. 55. Susantitaphong P, Riella C, Jaber BL. Effect of ultrapure dialysate on markers of inflammation, oxidative stress, nutrition and anemia parameters: A meta-analysis. Nephrol Dial Transplant 2013;28:438-46. 56. AAMI. Dialysis Standards Collection. Available from: http://www.aami.org/publications/standards/dialysis.html.2013. [Last accessed on 16 April 2014]. 57. Ledebo I, Blankestijn PJ. Haemodiafiltration - optimal efficiency and safety. NDT Plus 2010;3:8-16. 58. Nystrand R. Microbiology of water and fluids for hemodialysis. J Clin Med Assoc 2008;71: 223-9. 59. Chamney MJ, James RC. Dialysis water quality for renal nurses: Educational Supplement. Ren Soc Aust J 2008;4:13-20. 60. Centers for Disease Control and Prevention. 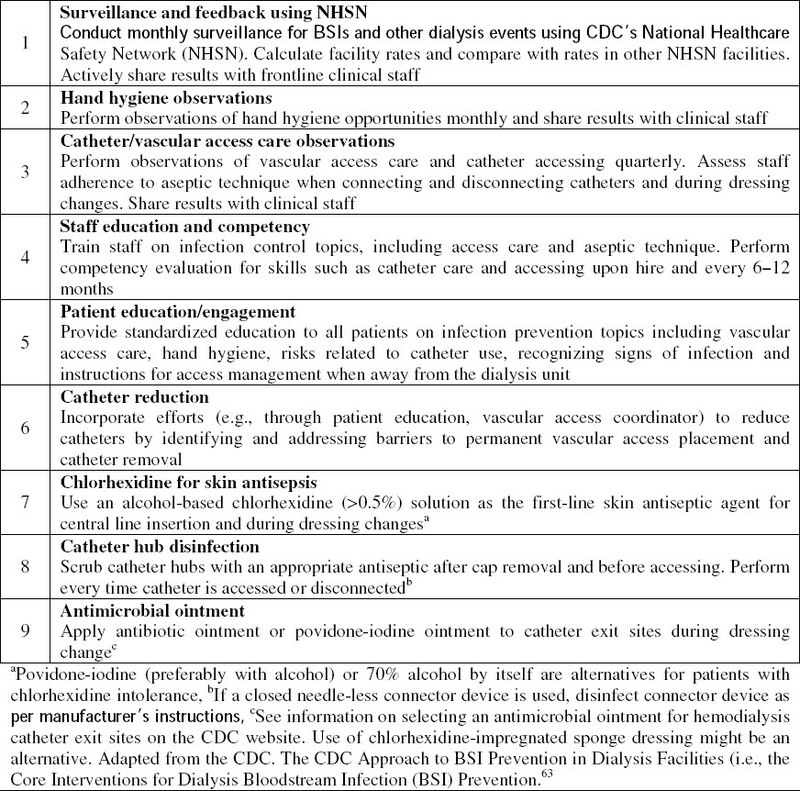 Infection control requirements for dialysis facilities and clarification regarding guidance on parenteral medication vials. MMWR Morb Mortal Wkly Rep 2008;57:875-6. 61. Hoen B, Paul-Dauphin A, Hestin D, Kessler M. EPIBACDIAL: A multicenter prospective study of risk factors for bacteremia in chronic haemodialysis patients. J Am Soc Nephrol 1998;9:869-76. 65. Salzman MB, Isenberg HD, Rubin JG. Use of disinfectants to reduce microbial contamination of hubs of vascular catheters. J Clin Microbiol 1993;31:475-9. 67. Ly D, Yee HF Jr, Brezinia M, Martin P, Gitnick G, Saab S. Hepatitis B surface anti-genemia in chronic hemodialysis patients: Effect of hepatitis B immunization. Am J Gastroenterol 2002;97:138-41. 68. Mohan D, Railey M, Al Rukhaimi M. Vaccination and transient hepatitis B surface antigenemia. NDT Plus 2011;4:190-1. 69. European Best Practice Guidelines (EBPG). Section VI: Haemodialysis-associated infection, VI.5 Prevention and management of TB in HD patients. Nephrol Dial Transplant 2002;17 Suppl 7:77-8. 70. Centers for Disease Control and Prevention. Guidelines for preventing the transmission of Mycobacterium tuberculosis in health-care settings, 2005. MMWR Recomm Rep 2005; 54:1-141. 71. Kidney Disease: Improving Global Outcomes (KDIGO).Clinical practice guidelines for the prevention, diagnosis, evaluation, and treatment of hepatitis C in chronic kidney disease. Kidney International 2008;73 Suppl 109:S1-99. 72. Covic A, Abramowicz D, Bruchfeld A, et al. ERA-EDTA ERBP Advisory Board. 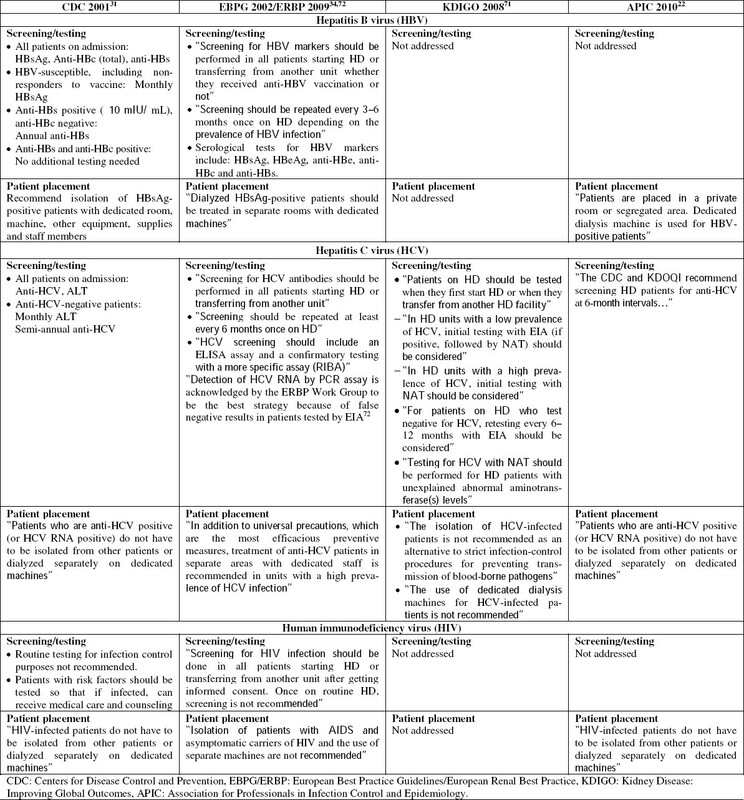 Endorsement of the Kidney Disease Improving Global Outcomes (KDIGO) hepatitis C guidelines: A European Renal Best Practice (ERBP) position statement. Nephrol Dial Transplant 2009;24:1-9. 73. Karkar A. Hepatitis C in dialysis units: The Saudi experience. Hemodialysis Int 2007;11: 354-67. 74. Mohamed W. Prevention of Hepatitis C Virus in Hemodialysis Patients: Five Year Experience from a Single Center. Saudi J Kidney Dis Transpl 2010;21:548-54. 75. Hussein M, Mooji J. 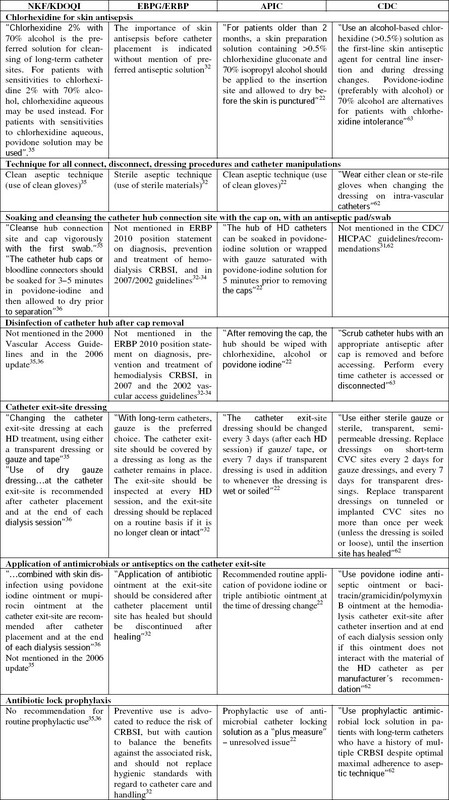 Methods used to reduce the prevalence of Hepatitis C in a dialysis Unit. Saudi J Kidney Dis Transpl 2010;21: 909-13. 76. Yang CS, Chang HH, Chou CC, Peng SJ. Isolation effectively prevents the transmission of Hepatitis C Virus in the hemodialysis unit. J Formos Med Assoc 2003;102:79-85. 77. Blumberg A, Zehnder C, Burckhardt JJ. Prevention of hepatitis C infection in haemodialysis units. A prospective study. Nephrol Dial Transplant 1995;10:230-3. 78. Alavian SM. A shield against a monster: Hepatitis C in hemodialysis patients. World J Gastroenterol 2009;15:641-6. 79. Huraib SO. Hepatitis C in Dialysis Patients. Saudi J Kidney Transplant 2003;14:442-50. 80. dos Santos JP, Loureiro A, Cendoroglo Neto M, Pereira B. Impact of dialysis room and reuse strategies on the incidence of hepatitis C virus infection in haemodialysis units. Nephrol Dial Transplant 1996;11:2017-22. 81. Thompson PC, Williams C, Aitken C, et al. A case of hepatitis C virus transmission acquired through sharing a hemodialysis machine. NDT Plus 2011;4:32-5. 82. Hotchkiss JR, Holley P, Crooke PS. Analyzing Pathogen Transmission in the Dialysis Unit: Time for a (Schedule) Change? Clin J Am Soc Nephrol 2007;2:1176-85. 83. Pyrek KM. Studies show great variation in contact precautions, impact on patients and care delivery. Infection Control Today, Personal Protective Equipment 2013;17:1-7. 84. Pyrek KM. NIOSH Working Toward Answers to Key Respiratory Protection Questions. Infection Control Today, Personal Protective Equipment 2013;17:1-9. www.infectioncontroltoday.com. 86. ACIP Adult Immunization Work Group, Bridges CB, Woods L, Coyne-Beasley T; Centers for Disease Control and Prevention. Advisory Committee on Immunization Practices (ACIP) Recommended Immunization Schedule for Adults Aged 19 Years and Older- United States, 2013. MMWR Surveill Summ 2013;62 Suppl 1:9-19. 87. National Center for Immunization and Respiratory Diseases. General Recommendations on Immunization, Recommendations of the Advisory Committee on Immunization Practices (ACIP). MMWR Recomm Rep 2011;60: 1-64. 88. Advisory Committee on Immunization Practices; Centers for Disease Control and Prevention (CDC). Immunization of health-care personnel: Recommendations of the Advisory Committee on Immunization Practices (ACIP). MMWR Recomm Rep 2011;60:48.